Playing original folk & pop songs & tunes by Ceri Ashton. The line-up has gradually evolved and grown to the current 6 piece band featuring Kate – bass, Karen – Clarinet, Anna – fiddle, Chris – guitar, Paul – Bodhran as well as Ceri on vocals, fiddle, flute & whistle. Bloody Rock ‘n’ Roll. A delicious band out of the depths of Sheffield. Four guys combined together to make a beautiful combination of aggressive rock and hip shaking melodies. Heavy & funky with a SUSHI serving of drum & bass. 5 piece folk rock band playing original, contemporary & traditional songs & tunes. I’m delighted to be organising the Community Stage again for Peace In The Park 2016. 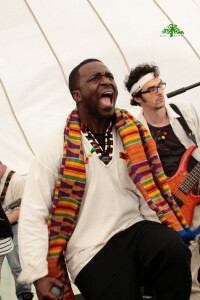 The Community Stage, was organised by Trevor Tomlin (Sharrow Festival), and was an inclusive, family and child friendly area with an art installation / exhibition and opportunities for children and adults to participate in workshops and performance. We focused particularly on world and folk music along with activities, dance and spoken word performances that attracted a diverse audience.